TPC Sawgrass is pro golf’s toughest test. The tournament boasts the strongest field on Tour. And the architect who designed the course loves being the most hated man in golf. At least for one week. 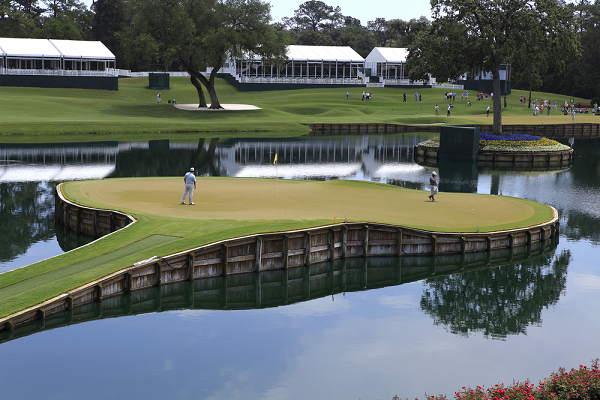 Perhaps no other hole on the PGA Tour is as closely identified with a tournament as the 17th at TPC Sawgrass. The iconic island green sits tranquilly in the water a mere 137 yards from the tee, yet many claim it’s the most terrifying shot in golf. Players have acknowledged that they start thinking about that shot before they tee off on the first, and some have admitted to having nightmares about it. It’s the perfect symbol for the Players Championship – a tournament that annually boasts a stronger field than any of the majors, on a course that doesn’t favour one type of game over another yet demands the utmost in shot-making under immense pressure. Tournaments have been won and lost on the 17th hole but despite its outsized reputation, the island green is but a small part of Pete Dye’s brilliant design. TPC Sawgrass was dug out of a swamp. Originally, the scant bits of land at Ponte Vedra were barely visible but as Dye and his crew shaped the holes, swamp turned into ponds and lakes and the surrounding fairways rose many feet above the water level, with broad contours and dramatic elevation shifts. The island green wasn’t planned but after scooping so much sand and muck from the surrounding area, Pete’s wife, the late Alice Dye, who was a championship calibre player and a course architect herself, suggested they just make it an island. Neither of them had any idea at the time that it would be so successful. Dye envisioned TPC Sawgrass as the supreme test for the best players in the world, and there’s ample evidence to prove that’s what he delivered. The golf course doesn’t favour any particular style of play or type of player. The Players Championship has been won by bombers and bunters and improbable longshots. The only thing they would appear to have in common is an ability for one week at least to manage their game and control their ball better than everyone else. In the past twenty years alone, big hitters such as Tiger Woods, Adam Scott and Davis Love III have taken the title but so too have bunters like Fred Funk and Tim Clark. For pure shock value, the heretofore totally unknown Craig Perks of New Zealand won in 2002, while Webb Simpson, who went AWOL after the anchoring ban, suddenly reappeared and claimed the trophy last year. In other words, anybody can win the Players Championship, which makes it incredibly fair. It also makes it extremely tough because the course rarely allows a player to play to his strengths. One hole turns left, then the next one turns right. One hole demands a high soft fade while another requires a draw. TPC Sawgrass is only 7200 yards, which is relatively short by PGA Tour standards, but it has so many turns and penalty areas that it can’t be overpowered. A player needs to make all the shots to score well at The Players and even when his shot-making is spot on, the greens set another demanding task. They’re firm and fast and bordered by every kind of trouble imaginable. The contouring is awesome as many will recall from Tiger Woods “Better than most” snake on the 17th green in 2001. This year the Players returns to its original time slot on the PGA Tour schedule in March. Many feel it will be an even tougher test than previous years when the tournament was in May. For one thing, temperatures won’t be quite as inviting and the wind should be more of a factor this time of year too, especially on the finishing holes where the players will be battling against a quartering wind. Pete Dye designed TPC Sawgrass to make players uncomfortable. If the most common phrase heard in the player’s locker room this week is, “I hate Pete Dye,” that won’t bother the architect one bit. The golf course will get into their heads and only a few will be able to overcome it. When asked who will win the Players Championship, the answer by knowledgeable people is the same every year, “the golf course”. That makes Pete Dye happy. And if the outcome this year hinges on an eight-iron shot that airmails the 17th green or a pitching wedge that bounces off a bulkhead, that too is by design. Nobody wins the Players Championship if he can’t make all the shots. Oddsmakers have established Dustin Johnson and Rory McIlroy as co-favourites this week at 12-1. They’re followed by Justin Thomas at 16-1 and Justin Rose, Rickie Fowler, Brooks Koepka and Francesco Molinari at 20-1. Tiger Woods leads a group at 25-1 while Canada’s Adam Hadwin is listed at 100-1. If I were to put a few bucks down on the eventual winner, I think I’d lean towards McIlroy, who is so overdue for a win it’s embarrassing; or Molinari, a great ball striker and the current hot hand; or his Ryder Cup partner, Tommy Fleetwood at 25-1 who has shown he can play tough courses and perform under great pressure. Ironically, over it’s entire history, the Players Championship has been won by a player from virtually every golfing nation on earth except Northern Ireland, Italy and England. I don’t know how that should factor into my bet but I’m sticking with them. Those countries can’t be shut out forever. Can they?